The Christmas Count season has begun! For us birders who partake, this is a big deal. You see, we don’t just go outside and randomly watch birds during a set day in December. The significant amount of time and effort associated with organizing the count, focusing on all birds in one given area, trying not to double or triple count that flock of waxwings flying around, and simply getting out of bed on a dark December night make Christmas Counts much more involved than a simple day of birding at the local patch. As with any autonomously motivated endeavor, we can make the day as arduous or easy-going as we like but no matter how we do a Christmas Count, they tend to be memorable, and, on occasion, legendary. The other key part of any Christmas Count is the sense of camaraderie shared by way of trudging through cold morning winter weather when the logical thing to do would involve a hot cup of coffee and a Tim Horton’s Donut Shop while watching the gulls through a haze of water vapor on the windows (or maybe just sleeping in). We also feel that unique sense of togetherness by knowing that each of us is out there concentrating on the birds and covering the ground even when our lips ache from pishing, House Sparrows fail to become real sparrows, and we can’t help but wonder to ourselves, “Um, why am I doing this”? Gulls on the cold Niagara. But then we remember that special birding moment when we saw a wood-warbler freezing it out with the rest of us (and thus sacrificing itself for the count) when it should be chasing bugs in Belize. 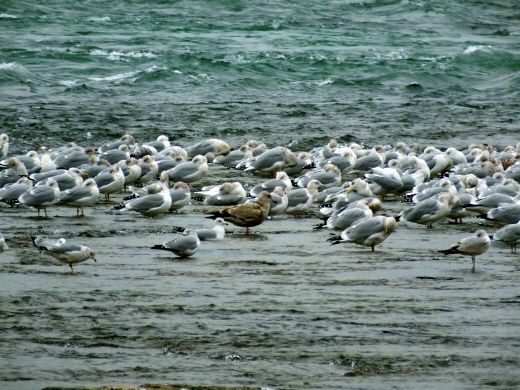 We recall those counts when the magic wonder of a blizzard of gulls erased the numb feelings in our toes and stopped the chattering of our teeth. We remember that we do this every year to gather data, to see if and how the avian scene is changing. We do these counts to keep the faith, to share it with faces old and new, and to remember the people who left us during the past year. 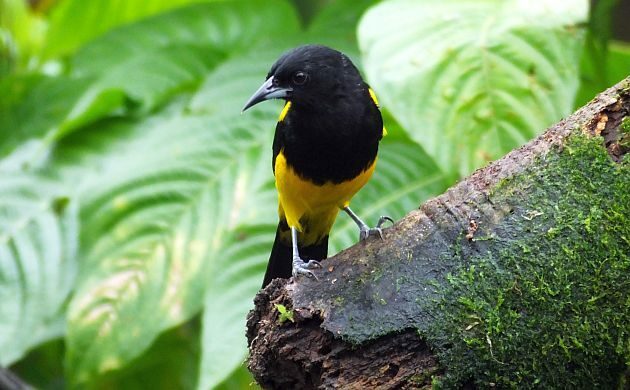 In Costa Rica, we sometimes deal with constant rain but never have to worry about numb toes or seeing just a few birds. Those wood-warblers that followed their survival instincts are here with us, and we still get up before the break of dawn, share the birding esprit de corps, and when the mosquitoes are biting, do occasionally wonder, “Why am I out here in this swamp?” But then we remember that slapping the little blood suckers might be worth it because, after all, this joint is kind of near the equator. There are hundreds of avian possibilities and you never know if some super rare lifer is waiting right around the next bend in the trail. No rain: This might sound odd for a highlight I’m sure that Mike and Corey would appreciate this! 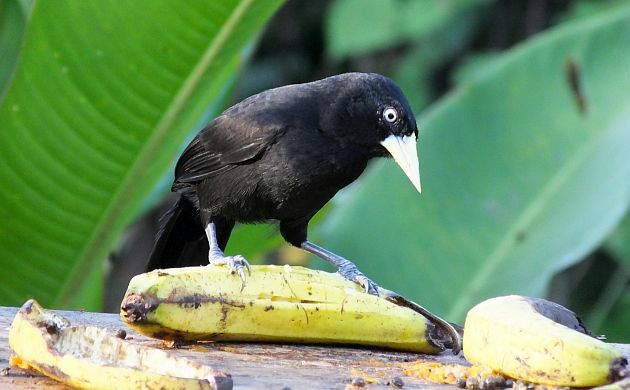 December is a time for rains on the Caribbean slope of Costa Rica so most counts at Arenal, La Selva, and other sites are just about guaranteed to be super wet birding events. This year, we were amazingly spared the rains by count day falling right between two tropical depressions, one of which was a hurricane. This resulted in wet weather before the count, a wonderful sunny time on count day, and constant rains right after! Counting birds at Luna Nueva on a good, non-pouring day. Finca Luna Nueva: Staying at this special place is always a highlight. It’s a bio-energetic, organic farm. It’s a comfortable eco-lodge. The food is healthy and damn delicious. Needless to say, it’s also a rare paradise for birds. While most of the lowland forests in the Arenal area were cut down some years ago, the woods at Luna Nueva were spared. It’s not a huge block of forest but it’s large enough to still host several deep forest species and provide valuable habitat for many migrants. Since this is an organic farm, the growing areas also provide lots of habitat for migrants and many local species, and are thus very birdy. Walk anywhere at Luna Nueva and you might not know where to start looking. We began our count day with the pre-dawn calls of Common Pauraque, Spectacled Owl, Mottled Owl, and a flyover Short-tailed Nighthawk. As the sky lightened, flocks of Red-lored and White-crowned Parrots filled the air with screeches and we added species after species as they sounded off and flitted through the trees. These included everything from wary Uniform Crakes to dozens of Red-legged Honeycreepers and Chestnut-sided Warblers, Slate-colored Grosbeak, five woodpecker species, Black-crested Coquette, six other hummingbird species, and more until our morning list included more than 120 species. It might be off the main birding trails in Costa Rica but this really is an excellent place to go birding and highly recommended (also because they are involved with finding and implementing solutions to climate change- check out the Carbon Underground). Our eBird list from the count morning at Finca Luna Nueva. 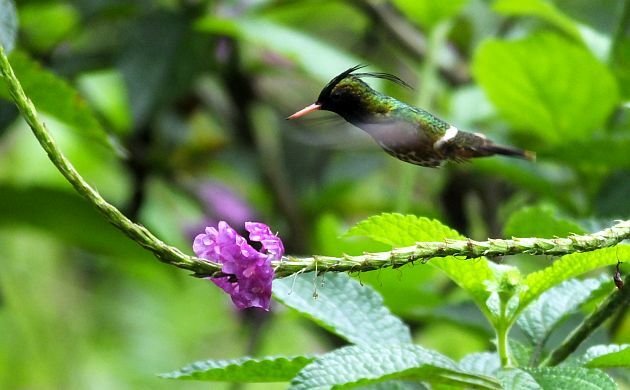 The Black-crested Coquette looks like it flew out of a birder’s imagination. It must be mentioned that this trail and habitat would not exist if it weren’t for local guide Geovanni Bogarin. 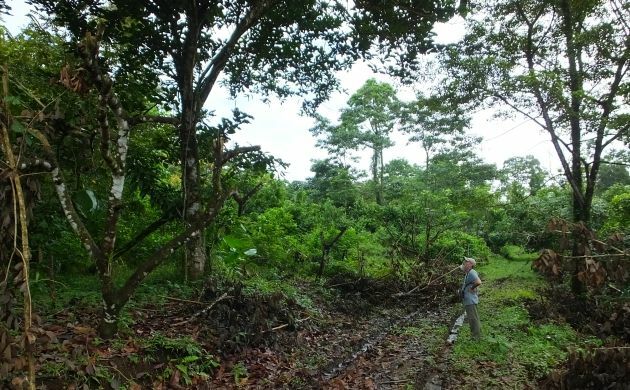 Some years ago, Geovanni asked the landowner if he could do something with an “unproductive” part of his land that had a small area of trees and springs. 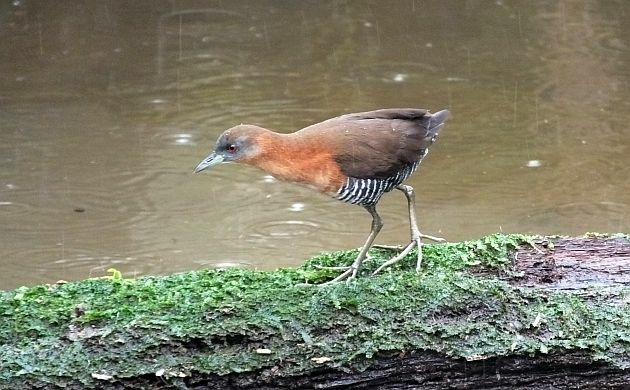 The owner agreed, Geovanni just let stuff grow, eventually put in a nice trail, and now it’s the most reliable place in the world to see Uniform Crake. 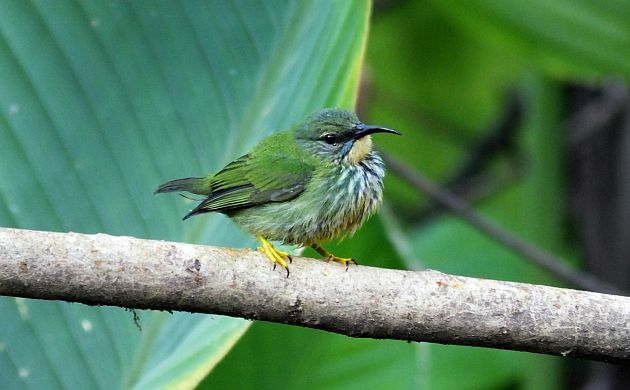 It’s also good for many migrants, hummingbirds (we had five or six Black-crested Coquettes), Rufous-tailed Jacamar, and lots of other birds, and shows how important natural green space and second growth can be for a huge number of species. 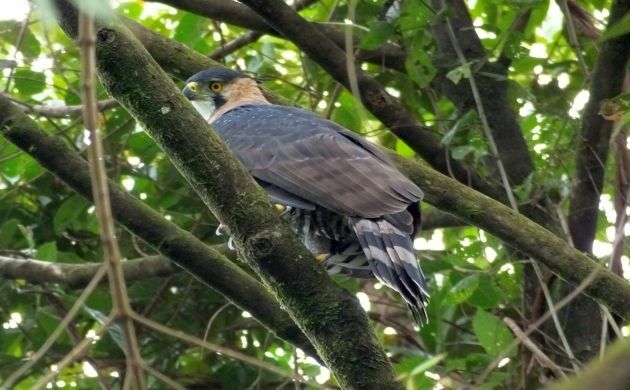 Ornate Hawk-Eagles: For the past five or so years, populations of this large raptor have been on the increase in Costa Rica. 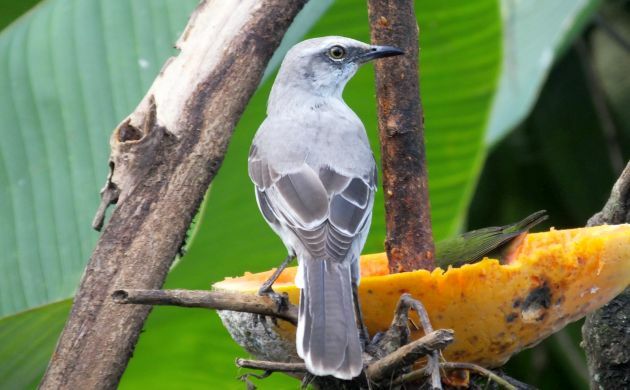 We aren’t sure why and it appears to probably be at the detriment of Black Hawk-Eagle but it means that if you go birding in Costa Rica for a week or so, you have a really good chance of connecting with this savage, crested beauty. Arenal is an especially good area for it and several were seen on various routes. Northern Parula and other rare birds: I know, a bunch of people are probably thinking, “Wait, Northern Parula? Rare? Not!” but oh yes, it is indeed a rare one for Costa Rica. We got more than enough Tropical Ps but the Northerns don’t like it this far south. Since they usually keep to Florida, Mexico, and the Caribbean, the one we saw at Luna Nueva was a major bonus bird (and species 782 for my Costa Rica list)! 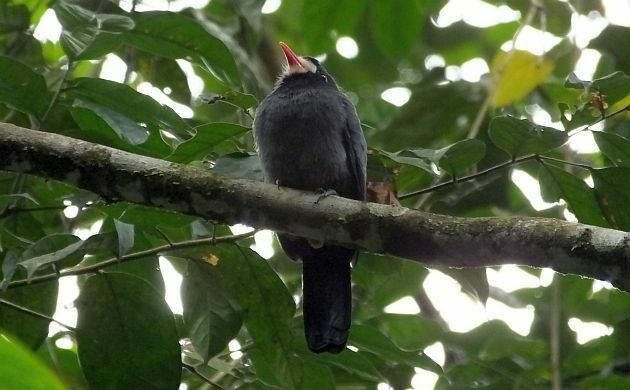 Other rare and uncommon highlights on our route included White-fronted Nunbird, Bicolored Hawk, Hooded Warbler, Gray Catbird, Black-crested Coquette, and Green Thorntail. A tree of 14 toucans was also cool even though they aren’t rare around Arenal. Other fine birds on count day from other routes included Bare-necked Umbrellabird, Lovely Cotinga, Sharpbill, and Yellow-eared Toucanet among other species. The final tally: The final numbers for our route hit 140 species and we still missed some expected birds! The final tally for all combined routes was 377 species, a new record for the count on a birding day to remember. Which counts are you doing? What were the highlights? Do you think Ornate Hawk-Eagles are master killers or just gaudy raptors? Please tell and share eBird lists in the comments! Sounds amazing, Patrick. I can’t believe you all stayed dry the entire time. If only I was there with you this year! @MIke- Yes, the wish for a dry count finally came true! Wish you and Corey could have been there. @Corey- I know, sorry, wish you were here! Oh man. This post is so darned unfair. I want to go back to Costa Rica! Where Are You Birding This Second Weekend of December 2016?